Is this development the govt is talkg about in skools? The Sign is surrouded by weeds….pliz employ someone for the cleang job. Yet the govt is signg projects worth Billions, but they can’t find any poor person to do the job. How can our students live with such a horrible sanitation which might b infested with snakes? 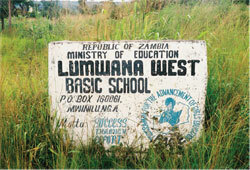 I call on the Zambia govt, Ministry of Education as well as the Council to comment on the Mwinilunga School’s emblem.